Shreve Cannon got the short end of life’s stick. Life in a trailer park caring for a younger brother and an alcoholic mother made his path all but inevitable. When we meet him at 15 years old he’s the kingpin of the candy-smuggling racket in juvie, keeping his wits sharp by outsmarting the ever-present warden Booth. Shreve made is mistakes but he’s no idiot; street smarts and sharp thinking keep him a few steps ahead of his fellow inmates. Enter Jack, an introverted and painfully shy 12-year old who is thrust into Shreve’s cell and life from nowhere. Jack is different, and the six fingers he sports on each hand are only the beginning. When he feels threatened, things get dangerous – explosively so. And his tendency towards blowing his top has attracted the attention of the sinister Quincrux, a menacing figure with an uncanny ability to get right inside your head. Before long Shreve and Jack are on the run, having busted out of their detention centre in flight from Quincrux and his malevolent German sidekick, the nurse. What follows is classic comic-book material as the pair soon learn to explore and control their powers, that which has been with Jack as long as he can remember as well as the talent acquired by Shreve during an altercation with Quincrux. They soon realise they can’t run forever though and must face the terror which is dogging their every step. In doing so they’ll uncover the answers to key questions: where did these powers come from? Who or what is Quincrux? And what on earth happened in Maryland to cause him to be so terrified of that place? 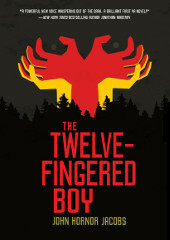 The Twelve-Fingered Boy is a perfect example of why I’ve been so enamoured of YA fiction in recent years. It’s incredibly fresh, fast-moving and original. Most importantly it never once talks down to its audience, instead taking great pains to pull no punches. At times it is brutal in its treatment of characters and while John Hornor Jacobs is no George RR Martin you get the feeling that it’s best not to get too attached to any characters, no matter how prominently they may feature. This is a fantastical science-fiction universe to be sure but it’s one in which consequences certainly exist, and in which they are not necessarily equal and opposite to the actions which invoke them. Behind the relentless action there is a story of confusion, hurt and trauma, tapping right into the adolescent psyche of the teens who really should be reading this book. Propping up the thrilling yet gritty storyline is a cast of characters so strongly portrayed they really do jump out of the pages at you. Shreve is a classic anti-hero, thoroughly likeable and roguish yet gloriously flawed and unashamedly so. He knows he has his rough edges and while he makes no apologies for them he does strive to improve. Jack’s fear is almost palpable, a lost child thrust into a chaotic world he doesn’t even begin to understand. And Quincrux – wow. So demonic is his nature that I couldn’t help but picture him as some kind of demented chimaera of ghost, scarecrow and those gangly Area-51 style bad guys from recent Dr Who episodes. Anything but human in other words, a personification of evil. The meat provided by the key players is more than enough to let Jacobs get away with occasionally taking liberties with plausibility elsewhere. The Twelve-Fingered Boy is only the first in a planned trilogy of books – awful lot of that going around these days. My recommendation is to get into the action now before someone snaps up the movie rights and ruins it for everyone. It’s far too short a read but every second is hugely enjoyable.